Please look here for answers to your kumhimo questions. Q: What size foam disk should I buy? A: I'm a firm believer in the 6" disk. While the smaller 4" disk is fine (and the braid will be the same size on either disk) the bobbins just don't fit easily under the smaller board. After all, if the function of the bobbins is to keep the cords from becoming tangled, then placing them under a board that doesn't have enough room for them defeats the purpose. A: You're making an 8 warp braid, so you need 8 cords (or 8 sets of cords). There are 4 two yard cords in the kit. Fold them in half and tie them in the center with a string, a twistee tie, or even make a knot in them. Place the string (tie or knot) into the center hole in the board from the top down. This will put all eight cords on the top of the board. Put one cord (or one set of cords) into the notches on both sides of all four dots printed on the board. This will give you four sets of two cords (or 4 sets of two groups of cords) that are evenly spaced on the board. Turn the board over and wind the cords into the no tangle bobbins. Turn board back to face up and you're ready to go. You may have to apply some downward pressure to get started. Just put your thumb on the center of the cords in the hole and push downward slightly for the first few sequences. Or use your index and middle fingers under the board to pull slightly downward on the thread or twistee tie. Some braiders will add a wight to the center of the cord; not my preferred option but it can work. Q: How much cord do I start with? A: 3:1 is a good rule of thumb. Use 3" of cord on all 8 warps for each 1" of braid you want to make. Adding beads to the cords will impact the amount of cording needed. Depending on the size beads and the type of cord, cut four 4-yard pieces (it's a good "rule of thumb"); eight 2- yard pieces if you're not using the "clean start". If you're using s-lon (or similar) and using beads in the size 8/o to 6/o range then four yards is plenty (probably more than enough but I like to err on the high side). Large beads will require a longer cord (since the cord has to go through the hole in each bead in addition to the braid); thicker cord also requires longer lengths as the cord has farther to travel as it braids around the others. And a thin cord that has to wrap around a much larger cord (say a piece of s-lon that is wrapping around a piece of 7/8" ribbon and also carries large beads (say an 8mm druk) needs to be about double the length of the others. Q: If I forget to put 3 at the top when taking a break, then what? A: You have a 50/50 chance of getting it correct so the best option is not to forget to park three at the top. The working warp is always the one that is bottom most. But, since this is a perfectly symmetrical braid, there will always be 2 that are bottom most. Therefore, you'll either get it right or 180 degrees wrong. Help yourself out, don’t “forget” to leave three at the top. If you’re working with an uneven color distribution and IF there are 2 different colors in the two bottom positions then you can, with some experience, look at the color placement in the braid that is under the board and determine which bottom warp is your next move. Q: I’m completely messed-up; nothing seems right. The warps are not spaced right on the top of the board. The best way to recoup is to just work the warps backwards. Keep them on the disk, just move the warps in the opposite direction that you’ve been working until you find the spot with the error. I usually go back a few more sequences and then just start working in the proper sequence. Give yourself a chance. Make 2 or 3 braids with no beads to get comfortable with the move sequence. A: Be sure to relax the tension in the braid. Depending upon the cording you're using this can add an inch or two to the overall length (it's a hollow braid). A: If you're mixing the weight of the warps (some thin and some thick) you will frequently use up one or two of the warps much more quickly than the rest. In the future pull a longer length on the thin. Ditto for warps that have beads on them. The smaller weight warps get used up more quickly because they have to wrap around the thicker warps within the structure of the braid. A: If you've got a braid that's short use it as a bracelet; make a necklace by cutting it in half and putting a bead set in the center (this is shown in my book Braiding for Beaders); use it as the center of necklace with a pendant slide on it (this is shown in the cover illustration of the instructions I wrote for the BeadSmith board). Put chain or beads on the ends to make it your desired length. A: The instructions with the BeadSmith board illustrates this in the lower left hand corner on the inside of the instruction sheet. My book Braiding for Beaders shows this on page 25 and my booklet "Kumihimop Braiding for Jewelry Designers" illustrates it on page 6. Just take a thread (I prefer size D S-lon), tie it just inside of where you want to make your cut. Wrap it around the braid a time or two (aka whipping); tie it off with a square or surgeons knot and trim the ends; cut the braid; glue the braids and the whipping into the end cap. A: If you don't want to whip the end prior to cutting here's an alternative: using a clear glue (I prefer Super Glue regular formula) put a drop or two where you want to cut the braid. The glue will soak into the braid and hold the warps in place. Once the glue dries just cut the glued area with very sharp scissors or a pair of flush cutters. Glue the caps into place. A: If you want to use head pins/wire and cones, whip the head pin onto the end of the braid (or braid the head pins as you make the braid), slide the cone over the headpin and the braid, finish with a wrapped loop. Q: Braid is too big/too small for the caps/cones, how do I make it fit? A: My braiding kit (starting about April 2009) comes with 2 sizes of caps: Four 6mm and four 3mm (sometimes 3.5mm) end caps. Kits prior to this had eight 6mm caps. If you're making a braid out of the #1 rattail that came with the kit use the 6mm caps. Eight warps of USA made #1 rattail makes a perfect 6mm braid (if you've reduced the braid by relaxing it). The nylon product that Fire Mountain sells as rattail is NOT the USA trademarked product and it makes a larger braid. A: If your braid has a really large diameter you'll want to use an 8mm or 11mm cap. The copper and gold necklace that I always have on display in my booth uses the 11mm brass caps. Or, if you're braiding with soft textiles (yarns or rattail) you can reduce the diameter of the braid during the whipping process. Just make sure that the whipping is kept short enough to be covered by the end cap or cone. The BeadSmith has recently sent specifications for larger caps to me for input. These new sizes ranging up to 16mm should be in production soon. A: if you've made a tiny braid and the caps you've got on hand are too large you can "cheat" the design by tying a knot about 1/4" from the end of the braid. This sets the cord cap up against the knot and you can't see that the braid doesn't completely fill the cap. Just make sure that the braid inside the cap is set against the side wall of the cap to assure good adhesion. A: You can easily make spring caps to the diameter you need if you've got wire and mandrels. Q: Can I use braids in jewelry designs without the use of caps or cones? A: Yes, I explore this option in the book Braiding for Beaders on pages 21 -25. Q: How much do I need? A: A good "rule of thumb" is 3:1. Use 3" of textiles on each warp for every 1" of braid you want to make. This changes when using beads--see answer to question #2 above. Q: How many beads should I use? When using beads on all 8 warps figure the size bead/inch x 8. EG: if using size 6 seed beads on all 8 warps you'll need 48 beads per inch. Long Magatamas on all 8 warps require 40 beads for each inch of braid. When mixing some warps with beads and some without the equation changes. When using 4 warps of rattail and 4 warps of s-lon with beads on 2 warps figure about 15 beads/inch. Warp threads with beads need to be about 2 feet longer than the others. Q: The beads aren't "right"; what's wrong? It's very difficult to slide beads on pearl cotton or embroidery floss. Use Tex 210 s-lon for your warps with beads or ex 135 (Fine) for beads with really small holes. Beads trapped in the middle of the braid can be cool; especially if you're using large wooden beads and hemp. 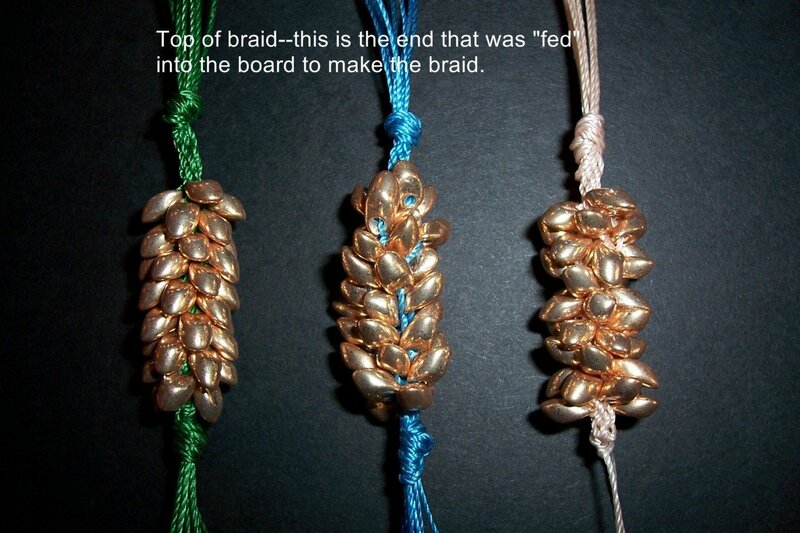 Try beads on just one warp and cage them within the braid; it's a very rustic look. Q: My braid is all twisted and lumpy! A: Most likely you're crossing over the center when moving your warp. Be sure to keep the left on the left and the right on the right. If the working warp is coming out of the bottom left notch it gets placed in the top left notch; if it's coming out of the top right notch it get placed in the bottom right notch. Q: What's the deal with long magatamas? A: Long Magatamas can be cool, but they can also be awful when used on all 8 warps. The odd shape of these beads present a challenge during set-up. Below are photos of what you can do with them when using on all 8 warps. Notes on each of the set-ups are below the photo. The "JTV Projects" button will show you several examples that use long magatamas on less than all 8 warps. Green= Pinecone. To achieve this look use 8 separate pieces of cord (don't use 4 and fold them in half unless you want to reverse the direction you're loading half of the beads). The beads were strung onto the cord "high hole" first and they feed easily into the braid structure because the flat side is facing down. Blue= Reverse Pinecone. Not recommended! It's very difficult to get the beads to "sit" properly when in this orientation. the beads were loaded onto 8 separate pieces of cord with the "low hole" first. When dropped into the braid the rounded side of the bead faces down and this pushes the bead upwards on the braid making it difficult to drop subsequent beads. Natural=Alternating warps. This is my favorite! Lot's of texture to be had on this one. This time you can use either 4 cords folded in half or eight separate cords. If using 8 cords, load 4 with the beads "hole high" and 4 with the beads "hole low". Then place them on the board in alternating positions. eg: Hole high in the NW, EN, SE, WS and hole low in the other 4 notches. Folding in half can be a little more challenging so here's a tip. Load all the beads onto all four cords "hole high". Slide half the beads to each end and tie a marker bead (I just use a seed bead) onto the end where the beads will be in the reverse position. This will help when you're loading the board to know how to alternate the placement. The end with the marker bead will be placed in NW, EN, SE, and WS. Loading beads in one direction and then sliding half to each end will automatically reverse the direction on 4 warps. Long Magatamas require 40 beads (5 on each of 8 warps) to make one inch of finished braid.